Well September is here and Summers lease is almost done. Labor Day Holiday marks the end of Summer here and like many this week end Leif, my wife and I took a trip into the mountains to enjoy a walk and picnic. Many people take along a barbecue, we took a couple of sandwiches and a bag of kibble for Leif. Leif enjoys the occasional trip out of harness. Working everyday is no fun for anyone, even a guide dog and so just for the day Leif was a pet, out of harness though his harness was not far away, in the trunk of the car, just in case we needed to go into a diner or store. The day was spent in walking around the various stopping points around the lake. Best of all was that it was only in the high 80's in the mountains, refreshing after the over 100 degree temperatures we have just had in the valley. Walking over some of the rougher terrain is not easy when you are visually impaired but it is still good for you. My wife makes a good sighted guide on these occassions and she also takes the photographs. I have been working a lot myself lately. 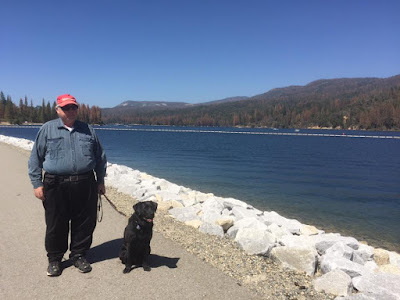 Since the early Summer I have been putting more effort into making the ''Blindside Fresno' television programs, we have another program waiting for a broadcast schedule date this month and are recording another show on Saturday September 17. Then on top of those I have spent a lot of time marketing and creating new items for my zazzle store, Bretsuki's William's zazzle store. So a day away from the computer and television studio was a nice change for both Leif and I.